Disruption, digital ecosystems and Porsche in the centre of it all – Lutz Meschke, Deputy Chairman of the Executive Board of Porsche AG and Member of the Executive Board responsible for Finance and IT, explains the challenges the company faces in this area, what it needs to do to overcome them, and why tradition is not a bad foundation, even in an era of disruption. Digitalisation is the future project – how is Porsche responding? Meschke: In my view, digital transformation is not a project, but rather a fundamental process of change. For our company, electromobility, digitalisation and conductivity are among the top priorities: we expect that by 2025, more than one Porsche out of every two sold will have an electric drive system. In order to be able to implement such features as full vehicle networking and thereby autonomous driving on a large scale, we need reliable, well-developed additional infrastructure. But isn’t Porsche dependent on other players in this regard, such as the political sector? It’s true, this is indeed a challenge for the political sector, given that we need a rapid expansion of the mobile data network towards the future 5G standard. We also need to drive the move from copper cable to fibreglass technology in the fixed-line sector, even more consistently than we have been: the mobility of the future will only function if we can rely on the underlying infrastructure. No – I always emphasise that we need to travel together on the road to the digital transformation: politics and the economy, hand in hand. There’s no other way that digitalisation can work. However, we need a network without a party political agenda, and we need objective discussions. This is something we are pursuing very intensively with the Strategiedialog Automobilwirtschaft Baden-Württemberg [Baden-Württemberg automotive industry strategic dialogue] initiative. Could you give us an example of your work there, please? 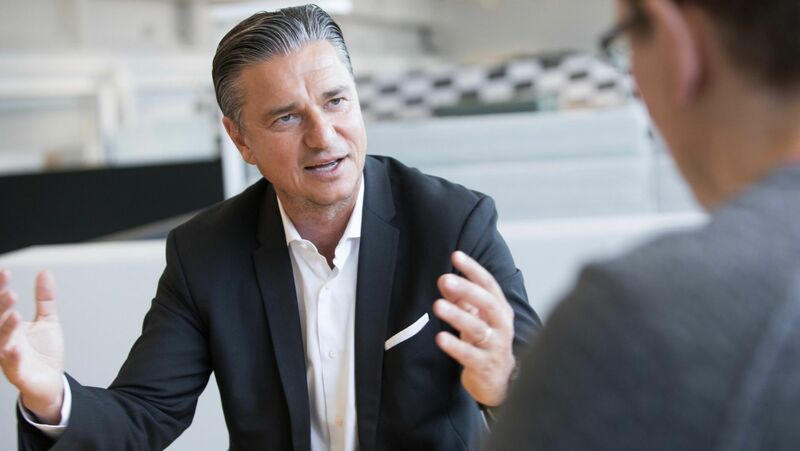 We have specifically been working on determining how to create the best possible conditions for a fruitful start-up culture in Baden-Württemberg, and to improve the digital training available. Start-ups are small and flexible – and their success is not necessarily guaranteed. Isn’t that the polar opposite of a Group like Porsche? It’s not so long ago that we ourselves were still a relatively small company. We have learned to achieve a lot with fewer resources; to be inventive with limited budgets. So actually, start-up culture is not so foreign to us. We have always said: not necessarily the highest horsepower, but we tease out the best possible performance. That is our strength. And how exactly does Porsche collaborate with the start-ups? It begins at a very early phase, perhaps when a company has not even been founded yet, but is simply an idea. Then, APX – the joint accelerator we have established with Axel Springer – invests in this still-young company and supports it. For start-ups that are in a more mature phase, we work with them on various projects via the Startup Autobahn innovation platform, and we develop new solutions together over a period of 100 days. If we are particularly confident in a start-up’s business model or solution, we may also invest directly in young companies. What ways of thinking are going to be important for the future? Completely “out of the box”. The impetus we get from start-ups is exactly what we need. Personally, I am convinced that at Porsche we need to be considerably more open in terms of our purpose as a company. Our corporate culture has been shaped by the field of engineering, and we are very good at continually optimising things further. But that can only continue for a few more years. After that, we will need completely new solutions – and to produce those, we need to open up right now: not just to the start-up scene, but also to other industries. After all, everything is growing closer together. But simply becoming more open is not enough, right? More than anything we need speed. Anyone with an eye on Israel, Asia or Silicon Valley knows that the world is turning incredibly quickly, and every day it spins a little faster. In Germany, there’s a general sense that ours is a very successful industry on which a huge number of jobs depend, and so we do not need to make any destructive decisions. The approach is always the same: measured, prudent. But in a disruptive world, there simply isn’t time to measure things out! We need to learn from the start-up culture that out of ten ideas, perhaps nine will die – a lesson written in the very name given to describe investments in start-ups: risk capital. So how can working methods be speeded up? We can do this by not testing every product and every process in detail before we begin implementation; by the time we get to the end of this testing, the technology is no longer current or the process approaches are outdated. Instead, we will divide each topic into small steps and move towards initial implementation after a relatively short time. This approach makes it possible to learn the next step needed for enhancement immediately, and means that after a short time you have a product that you can use as a pilot. Perhaps you keep it all internal at first, or perhaps it is already so good that you can collect customer feedback. Then you move on to the next round. Many of our digital and innovation units are already using this approach. What is the customer’s role in digitalisation? Are they the data supplier? Quite the opposite, in fact. If you want to succeed in a digitalised world, you cannot view people as a mass of data. Instead, you need to develop products that treat people as unique individuals. It’s no longer the case that people need to adjust to technology; rather, technology needs to serve people – which of course means that we need to understand people better. The topic of security is also a constant source of discussion in this context. Where is Porsche in that regard? We are, of course, closely focused on this topic. With increasing networking and the associated services that have come about as result, the requirements in terms of protecting digital information are inevitably becoming more stringent. We are facing up to this challenge in close collaboration with consumer and data protection agencies, those in the political sector and insurance companies. Customers are informed in detail about which data is collected, how this data is processed and what purpose it serves. They can also decide for themselves whether they are happy for their data to be collected and used. What’s more: we are working with future technologies such as blockchain and conducting testing to see how we can guarantee the highest possible safety standards. In summary – what is the trump card that Porsche holds in the age of digitalisation? Unlike many other players on the market, we have a strong tradition behind us. We will not simply throw away everything we have built up over the decades; we will carry the Porsche experience into the future. I am convinced that in the megacities of the future, owning a car will not be important; instead, mobility on demand will be key. But who says that the form of end-to-end mobility chains or a digital lifestyle cannot be custom-tailored and characteristically Porsche? The Zuffenhausen-based sports car manufacturer is launching the pilot programme for its “Host” service.